Replacement Steam Generators and Electronic Control Units. Available in both standard, combined box types and Slim-Line types. We also have available ones to control Electronic Control Pads with integrated Digital Televisions in your shower. 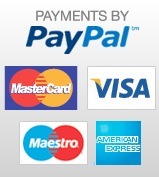 Each Generator is rated up to 3kW rating and for UK pwoer use only. The electronic control system enable connection to a matching control pad (not included) and leads to connect to Fans, Lights, Ozone, Speaker etc. This package allows you to fully upgrade your shower to feature a 3kW steam system. 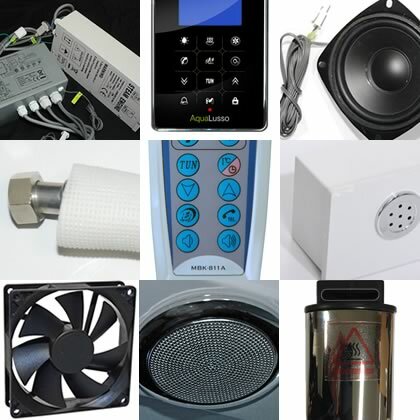 This product package features a slim-line steam generator and separate electronic control unit. This model features Bluetooth for audio steaming from your Smartphone or Tablet. 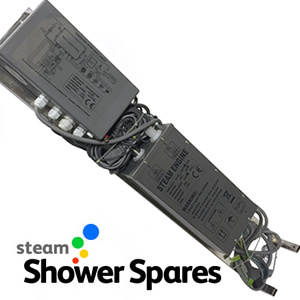 This package allows you to fully upgrade your shower to feature a 3kW steam system. This product package features a combined steam generator and electronic control unit. 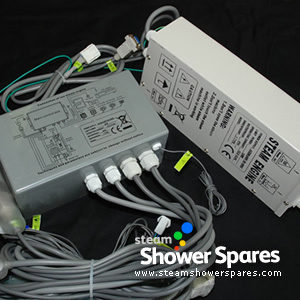 This package allows you to fully upgrade your shower to feature a 3kW steam system. 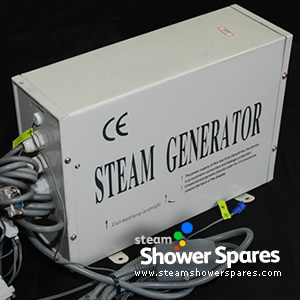 This item features a COMBINED generator, where the steam production unit and the electronics are fitted into one neat boxed housing. 3kW Steam Generator for replacement on showers with a 'Slimline' electronics system and steam generator bearing the MK220 code. 3kW Steam Generator for replacement on showers with a 'Slimline' electronics system and steam generator bearing the MK117 code. 3kW Steam Generator for replacement on showers with a 'Slimline' electronics system and steam generator bearing the TR019 code. 3kW Steam Generator for replacement on showers with a 'Slimline' electronics system and steam generator bearing the TR002Y-1 code. 3kW Steam Generator and electronic control unit for steam showers with code: TR029N. This system is compatible with TR029 fittd to Colorspa steam showers. 3kW Steam Generator for replacement on showers with a combined electronics system and steam generator bearing the MK220 code. 3kW Steam Generator for replacement on showers with a combined electronics system and steam generator bearing the TR002Y-1 code. 3kW Steam Generator for replacement on showers with a combined electronics system and steam generator bearing the TR001 code. 3kW Steam Generator for replacement on showers with a combined electronics system and steam generator bearing the MK117 code. 3kW Steam Generator for replacement on showers with a combined electronics system and steam generator bearing the TR019 code. 3kW Steam Generator for replacement on showers with a combined electronics system and steam generator bearing the TR088 code.